This is the Book-of-the-Month Club paperback edition of A Thief of Time. This edition was published in 1988 by Harper & Row in New York City, New York. This book is part of the Quality Paperback Club and as such, has no price or ISBN. Also, there is no edition or printing code on the copyright page. The cover illustration was done by Peter Thorpe. 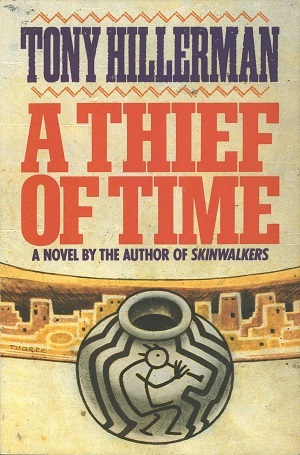 Thorpe was the designer for over 40 Hillerman editions and his covers became the iconic representation of Hillerman's work. Format: Paperback, 23.4 x 15.5 cm. Binding: Full color paper covers with the author printed in purple, the title printed in red, and publisher printed in black vertically on the spine.